I waited 40 years to see the man who made me breathless with laughter in the late seventies on TV. Jasper Carrott, like Billy Connolly, was one of those stand-ups who earned their stripes with a lot of hard graft before TV made them a household name. In those pre-VHS/DVD days, one of my best mates at school used to lend me audio tapes of his live gigs. I played them on a loop, and his tales of Biffer the loopy Labrador, and problems with a mole brightened many a dark day. His accident insurance claims forms were also pure comic gold. Little wonder the Beeb gave him his own TV series, but as good as Carrott’s Lib and Carrott Confidential were, he eventually seemed a bit bored with it all. Then one day, he dropped off the TV radar. And that was it. Or so it seemed. While younger comics like Alistair McGowan basked in the media spotlight with terrific impressions, and Jasper’s daughter Lucy Davis became a star via The Office and Shaun of the Dead, Carrott enjoyed a well-earned retirement, tinkering behind the scenes as one of the brains behind Who Wants to be a Millionaire?, the show which aptly made him a tycoon. 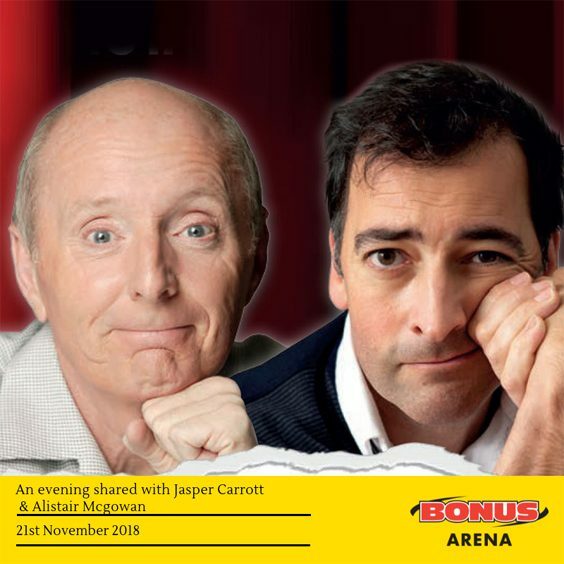 So on a freezing night, having juggled work shifts, and walking a couple of miles to and from train stations for the gig, I’m hoping the show which unites Carrott and McGowan is worthy of the effort. In the summer of 2017, Jasper announced that he needed major heart surgery, and to see him on stage it looks like the op has given him a new lease of life. Having endured tighter security than Heathrow Airport, I settle into my first gig at Hull’s Bonus Arena. McGowan is a terrific warm-up, whipping through a series of engaging impressions. As usual he spends too long on sport (not my thing), but it’s worth it for the comedy gold he also creates from sending up Gogglebox, Dara Ó Briain, Brian Cox, Parky and other quickfire routines. His material is spot on. Structurally the show is perfect. Alistair does his set, then Jasper comes on to rapturous applause, not least from this obvious fan. Even the best comics struggle to entertain for a solid 90-plus minute set, so sharing the load ensures there’s no danger of comedy fatigue setting in. And this is ‘The Carrott’ I recall from those early days. He’s a little cautious at first, testing the water before diving in. Inevitably there are gags about getting older, but as the second half unfolds, and Alistair delivers some breathtaking, multi-lingual schtick and a brilliant Dad’s Army routine, Jasper returns for the final set with a powerhouse performance. His car insurance claim forms come out of a back pocket, and fans like me are way ahead of him, applauding before he says a word. A few of the old ones set the scene for newcomers, and then a collection of new forms have me in hysterics like the first time I saw him on TV. By the time he’s on one of his final anecdotes, about sharing a dinner do with Lady Di, he’s possessed by the spirit of a man from four decades ago. It’s beyond a joy. I’d hoped for the old Carrott magic, and he delivered on that unspoken promise and then some. Sadly there’s no mention of the mole or Biffer, but it hardly matters. Having seen some of the world’s best comedians do their thing on stage, from Seinfeld, Eddie Izzard, Ó Briain, Mack and Connolly, it’s a delight to see the granddaddy of them all still delivering the goods. An unforgettable night and well worth the wait.